is very powerful. Perhaps I will write about it some day but this post is about the “Platform” part of Platform BPO. The first victim of in-flight customer service in India has been the cologne splashed cold towels. If they are never going to make a comeback then they deserve an obituary. The cool touch of the soft fabric on the hypothalamus has drenched many a tired commuter of her stress and has wiped copious grimes off oily faces. Did anyone ever looked down at the offered tray of towels and said “no, thanks, I’d rather stink”? Never. So why did this service get the axe rather than the “would you care to give some feedback, Sir” (push that to the web) or “Sweetlime for you, ma’am” (per bottle MRP Rs.15)? So, as a Product Manager do you generally pluck off the most widely used feature of your product even if you found that to me the more expensive one? I guess not. A scented paper towel came along with the breakfast tray. Why? My I suggest Jet Airways tries this. Hand over a partially opened pack of a wet-tissue to every disembarking passenger. Keep a bin in the bus that ferries the passengers to the terminal or where the aero-bridge joins the terminal. People appreciate a “pain-killer” much more when they are closer to the “pain”. PS 1: There is wonderful company called dimdim that will put web-conferencing on your desktop. For free. And here is how they gather customer preference of their features. Interesting. PS 2: I ran some numbers last night on the US airline industry. Scared the hell out of me. Take a look. 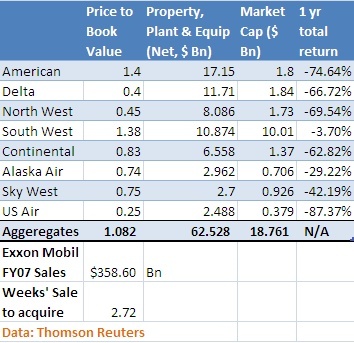 Exxon Mobil can keep aside 3 weeks’ of sales to acquire the top eight airline companies in the US. It is seldom that I make two posts on a given day, but I just had to narrate this. The media and the IT industry in India would make us believe that the job scene in Bangalore is getting tighter. Gone are those days of telemarketers calling you to offer a credit card and should you refuse, a job as well. No, not so fast. In my last visit to the office men’s room today I heard someone taking a call from one of the toilet stalls. It was a job interview. Out of simple curiosity I hung around for longer than I should have and eavesdropped (is “eavesdrop” applicable to a conversation that’s happening at a, umm, well, almost public place?). The person spoke about his skills (both databases and dot net, he said) and his current project engagements (I can’t mention that). Obviously he impressed the interviewer because I suspect the conversation veered towards how quickly can the person join the offering company. The interviewer was reminded about the notice period and that she(?) had to buy out the time in case there’s a need for earlier onboarding. Precisely at this moment I heard the toilet flush with a finality that must have been a broad hint to wind up the interview. (a) What kind of organizations satisfy themseleves with interviews that last for as long as one needs time to answer the other call – nature’s? (b) Why would someone want to interview with a future employer sitting on a john and (most likely) pants down? Don’t give up on the labor market in Bangalore. At least not yet. Are you still training your users? Why? A friend on mine once made a rather remarkable observation. The effectiveness of the Ministry for External Affairs should be measured through a reverse correlation with the country’s spending on defense, he argued. The proposition is quite bullet proof because the former’s good show should most likely decrease the latter. The parallel in software products (or perhaps any product) is the relationship between Usability and Training. The more usable and intuitive to use the product, lesser the organization should spend on training. Actually, I would recommend that one goes a step further – make it a target for the product design and usability team to reduce training expenses by x percent. And promise that the savings will be ploughed back into setting up a usability lab for the team. Remember, Usability is an investment, training is an expense. Apple i-pods don’t ship with an instruction manual. I will find some time to write about delivering training for products (after all, if many take this post seriously the entire need for providing training may disappear very fast!). The current general practice of sending trainers to the client base is broken. Your web-based product has state of the art IDAM (Identity and Access Management) systems. That is, it is Fort Knox when it comes to letting users in. Nothing wrong in that. Actually, it is great because you don’t want people to pilfer your product. The trouble is, sometimes people forget their credentials – most often their passwords. Most web products have a link just below the login area that says “Forgot Password”. Against a few questions or on submission of a valid e-mail ID, your user credentials are mailed back to you. Now here starts the problem. Thanks a lot for using <<your company name>> for all your financial research needs. We hope your experience has been good and we have kept upto your expectations. We find from our records that your last login to the product was on <<date>>. Since then we have been busy bringing newer features and content in our products. You can find more details on the splash page just next to the login section of the main website. We hope to continue working on your requirements and make <<your product name>> the one-stop-shop for all your research needs. Inturruption Marketing lost out when it irritated people by intruding into their lives. Not this one – this is Permission Marketing. This is one e-mail that most people will read. So why let the opportunity pass? So what’s your domain skill? No – don’t answer that one – yet. What is your domain? Yes, go on – answer that. I have seen many software companies fail to arrive at a consensus answer to this seemingly innocuous question. The highest propensity is to gravitate towards the business for which software is being written. If that happens to be helping fixed income traders price derivative embedded bonds, the “domain” gets defined as “fixed income”. And once defined, everyone wants to become “domain experts”. If this line of thinking were true then everyone associated with automobile engineering would start harboring aspirations of becoming a Formula One race driver. Thankfully that doesn’t happen. It is sad that many senior leaders in the software industry cannot break the problem up in order to solve it (wasn’t that the first thing they taught at engineering?). “Domain” means different things to different people. Continuing with the same example, “fixed income” might very well be the domain of the business analyst working to build the pricing application (it probably also is a good part of the testing team’s domain – the guys who will surrogate the customer to test the application). But spare a thought for the developer who is writing this application in C#. Is his domain not “C#” and/or possibly “dot Net”? Reckless definition of the domain then spreads like cancer throughout whatever decisions it perpetrates – most importantly learning and development. Training courses get organized where the “Fixed Income” domain is taught. The business analyst attending the course knows more than the curriculum because her job mandated that she read half of Fabozzi’s text book to even make it to the role. That’s fine – at least there is no distraction for the business analyst. Developers on the other hand may find these new concepts intriguing and start reading up about Indexed Bonds and try their hands in bootstrapping yield curves in excel (yes, excel – because that’s about as much “systems” the instructor knew”. The ace C# developer has been set on the path to become a sub-standard business analyst.